Being “green” or “sustainable” is not exactly top-of-mind for many people. Part of the reason is that the jargon can get in the way of understanding what are often pretty straightforward ideas. So let us explain. 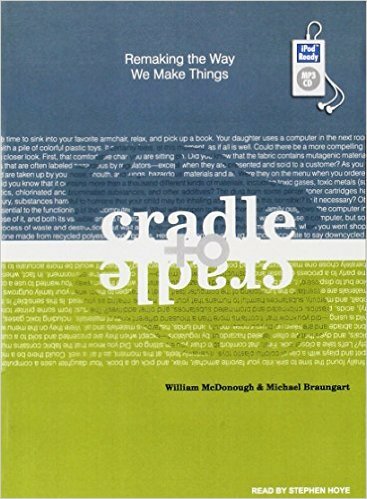 “Cradle to cradle” refers to an approach to designing products in a way that mimics nature. Specifically, the way that nature doesn’t waste anything. So for example, when an animal becomes roadkill, you may notice that buzzards quickly descend on the carcass and devour it completely. The entire animal becomes food for – in this case – buzzards. The roadkill is gone, there is no waste, and the buzzards continue happily on their way. “But what’s that got to do with me?” you ask. The connection is that, in our industrial society, we have created systems that are linear instead of circular. We use stuff – whether it’s food or your car or your clothes – and eventually we dispose of it, in the trash or a scrap heap or a landfill. There is no equivalent to the buzzards completely devouring the carcass. Our stuff appears to “go away” when in fact it doesn’t. It piles up – usually somewhere out of sight – and quietly creates greenhouse gas emissions or pollution or contamination. It’s a “cradle to grave” approach that wastes up to 90% of the materials that are used in the process. In contrast, designers, architects, and business people who think in “cradle to cradle” terms want to create products where all the materials – from food to metal to fabric – are seen as “nutrients” that continually circulate in healthy, safe ecosystems. Rather than throwing things “away,” we return them to whatever circle they belong to, and they are used once again. It’s much more efficient than our current manufacturing systems, and much less harmful. Biological materials are treated as “biological nutrients” and inorganic materials like metals are treated as “technical nutrients.” (Sounds funny, I know.) But the point is that everything is used and reused in ways that don’t waste anything and don’t harm the environment. It’s a different way of thinking about things. Cradle to cradle is not a new idea. The phrase was coined in the 1970s by Walter Stahel, a Swiss architect who went on to co-found the Product Life Institute in Geneva. 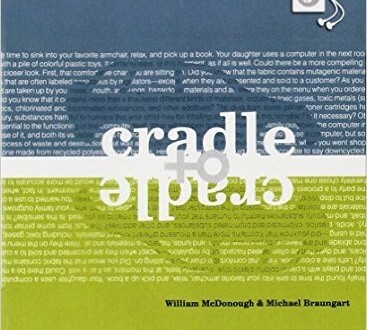 It was given further prominence in the U.S. with the 2002 publication of the seminal book, “Cradle to Cradle: Remaking the Way We Make Things” by William McDonough and Michael Braungart. Its latest incarnation or extension comes in today’s discussions about the “circular economy.” It’s a very different framework for producing goods, growing food, and frankly – living our lives. Cradle to cradle thinking is a “paradigm shift,” as they used to say. And it’s a welcome path out of the “cradle to grave” approach we’ve been following since the industrial revolution began. Do you see opportunities in your life to apply cradle to cradle thinking? That is the wave of the future. So the next time someone mentions “cradle to cradle,” you’ll know what they mean. And you’ll be able to add your own good ideas to the discussion!